The one day in Hawai'i when I didn't take any tattoo pictures, I did pass out a few fliers. One I handed to a woman sitting in a chair at the Safeway Center on Kapahulu Avenue. 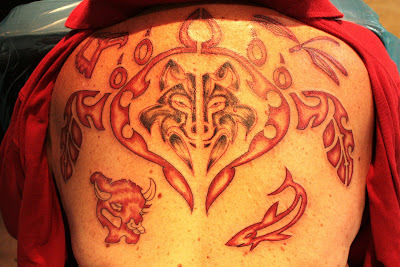 She had what appeared to be an incredible back piece, the top of which was visible to passers-by. Sylvia later e-mailed me and shared a link to a site that featured a photo of the tattoo, along with an explanation of the piece. I have extracted it here for the enjoyment of the Tattoosday audience. 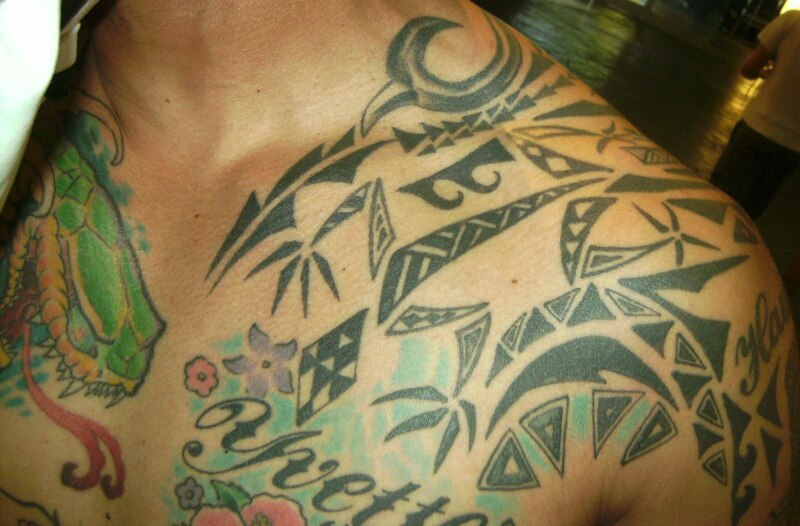 "My tattoo represents my ancestry...from the family of the 'Royal Hawai'ian Ole' (chanters of the Alii court), from the snowy mountains of Japan, the homeland of Portuguese Bean soup, and the inter-mix marriages of American Indians and Puerto Ricans. I believe the seven I have on my back describe who I am the best. Most locals have meaning for their tattoos but we also have people like Lindsay who just go with their flow. Many families have several signs that make up their families even as far as the Scottish Clan "Duncan" like me..."
What's wonderful about this tattoo to me is that Sylvia has incorporated so many cultures and motifs into the design which, as she acknowledges, is based on the wonderful mix of heritage and ancestry that comprises her background. This is very typical of people who live in Hawai'i, which is host to such an explosion of multicultural intermingling. I love how the honu/sea turtle brings all of the elements together. The eagle, dragonfly, bear paw, wolf, buffalo, and shark all join to provide a rich tapestry of images that each speak to a different aspect of her heritage. Sylvia's tattoo was inked by Joseph Garcia, Trigga Happy Tattoo in Waipahu. Eagle, Dragonfly, Bear Paw, Turtle, Wolf, Buffalo, and Shark. Thanks to Sylvia for responding to me initially and for sharing her tattoo via her post here. We here at Tattoosday appreciate your contribution! I met Eric on Seventh Avenue between 23rd and 24th Streets earlier this month. Eric is a mixed media artist whose website can be seen here. He is an illustrator and is currently in school studying toy design. 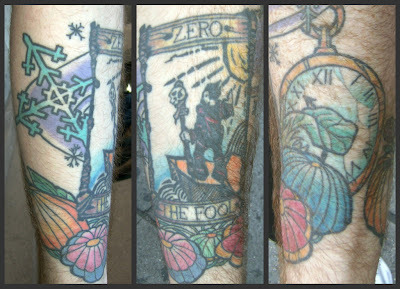 The tattoo he has is primarily based on a linoleum block he had created that recalls the Tarot card "The Fool". Because it is an unnumbered card in the deck, it is often referred to as "Zero" or 0. The Fool often represents the beginning of a journey, oftentimes a "foolish adventure". He had this tattooed to commemorate his decision to move from Boston to New York City. While the decision may not have been foolish, it did mark a new journey in Eric's life. The card was tattooed by Hannah at Regeneration Tattoo in Boston. The additional elements in the tattoo speak to Eric's obsession with the passage of the time. Snowflakes are only temporary as they fall from the sky and melt, or become mixed with other flakes and lose their singularity. The flowers are imagined creations representing growth. 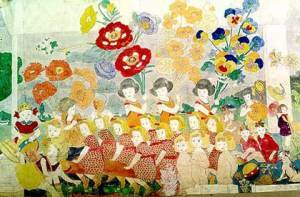 Eric's floral images are inspired by the artwork of Henry Darger. This, he says, represents the fight against the obsession and paranoia over the passage of time. The work around the tarot card was all tattooed by Kelly Krantz at the now-defunct Hold Fast Tattoo in Williamsburg, Brooklyn. 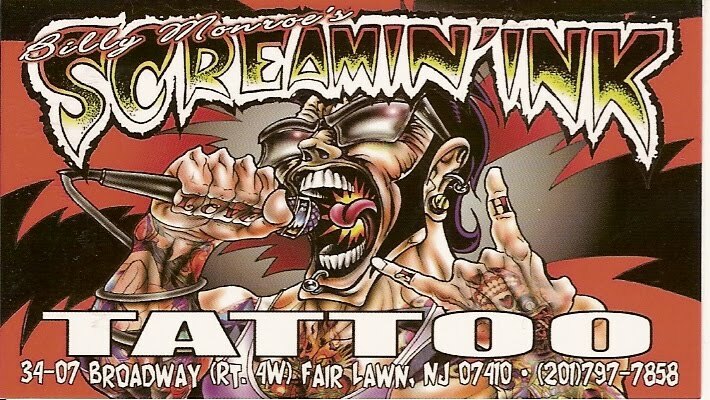 From what I can tell, Krantz is not currently affiliated with any one tattoo shop. 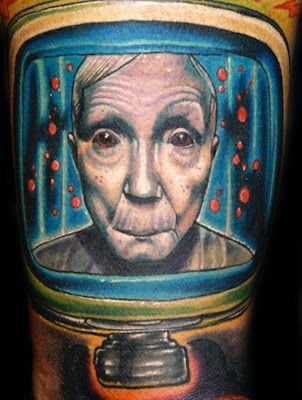 Thanks to Eric for sharing his thought-provoking tattoo with us here on Tattoosday! Erin explained that these yellow roses on her left forearm are for her grandmother, her favorite person. Her grandma's favorite roses are the yellow variety. 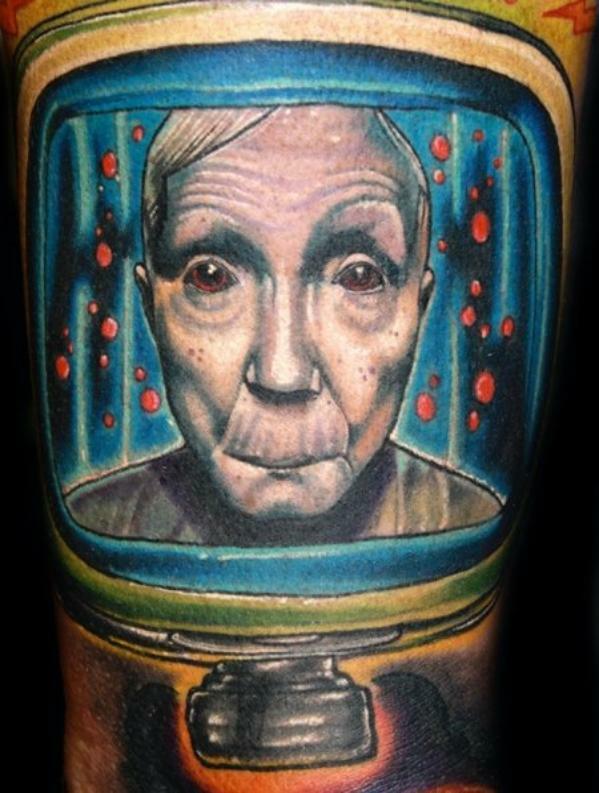 Erin credits artist Jesse Gabriel at Halo Tattoo III in Syracuse, New York for this work. Work from Halo has appeared previously here on Tattoosday. Thanks to Erin for sharing her tattoo with us here on Tattoosday! It's Fleet Week in New York City this weekend, so it only seemed fitting, with just a few Hawai'i posts remaining, that we share the following offering from Jack, a Chief Petty Officer (E7) in the U.S. Navy. Jack's was the final tattoo I spotted at Pearlridge, on what turned out to be a record-breaking detour for me (five tattoos from five different people in just under two hours). The skull at the center of the tattoo is wearing a hat similar to those warn by Navy chiefs. 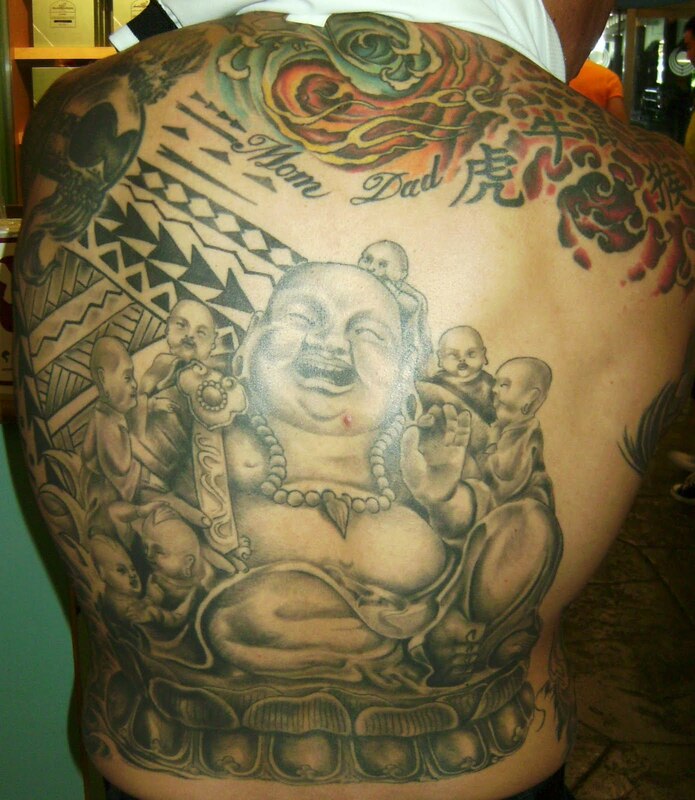 The artist for this piece is known as "Buddha" out of Liquid Metal Tattoo in Aiea, Hawai'i. Thanks to Jack for sharing this, his newest of over ten tattoos, with us here on Tattoosday. We here at the site salute not only all the men and women in uniform visiting New York during Fleet Week, but to everyone in all branches of the Armed Forces as we enter into Memorial Day weekend. Thanks to all for their service to our country! One of the most popular symbols in modern Polynesian tattoo is the green sea turtle, or honu, as it is known in Hawaiian. I saw a lot of honu tattoos while I was in Hawai'i, but I didn't snap any photos of them until my last day on Oahu, when I was wrapping up my trip with a last minute stop at Pearlridge. More specifically, I was at the Pearlridge Longs Drug Store, a great place to stock up on chocolate-covered macadamia nuts, Kona coffee, and other tasty local snacks that are hard to find on the mainland. While wandering the aisles, I spotted not one, but two honu-adorned locals, who were kind enough to share their tattoos with me. First was Ash, who didn't say much about the four honu on his left leg, other than the fact that he has "always loved turtles," and that his brother was the artist who did the tattoos. This not only has the honu element, but also has a floral aspect, along with a Yin and Yang design. When I asked her where the design came from, she laughed and said she had seen it on a sticker plastered to the back of a car. She liked it so much, she got some paper, traced it, and brought it into a shop called Big Fat Tatts, where the artist sketched it and cleaned up the lines. Thanks both to Ash and Chantel, for finally getting me my photos of honu tattoos, just a few hours before returning to New York. issue of Holly Rose Review. Holly Rose is the brainchild of Theresa Senato Edwards (who herself is a tattooed poet), who has given us four deliciously beautiful online issues that embrace both tattoos and poetry. The online literary 'zine juxtaposes brilliant tattoo work with the poems of an assortment of diverse and talented writers. Each issue bears a theme, and the last (and sadly, final) issue is "Worry". What's unique about Holly Rose is the juxtaposition of poetry and tattoos. It's an illustrated volume, but Edwards assembles poems that not only speak to the theme, but almost seem as if they could be captions to the body art displayed. Issue four features tattoos created by Luba Goldina, Sean Herman and Maxime Lanouette. And their work seems to transcend the description "tattoo" as the illustrations serve as works of art that correspond to the themes illuminated by the accompanying poems. poems' pages, so the reader can not only read the poem, but hear it in the author's voice. One page even features a video of the poet reading her work.These added dimensions make Holly Rose a truly magnificent experience. All four issues are currently available for perusal on the website http://www.hollyrosereview.com. If you're not a fan of poetry, check it out anyway and see some amazing tattoos. Maybe you'll discover some poetry you'll enjoy. Issue four features work from Dorianne Laux, Jayne Pupek and Changming Yuan. Issue three contains work from Christine Hamm and Joseph Millar, both participants in the 2010 Tattooed Poets Project. Issue two has poetry by Martha Silano and Daphne Lazarus (whose tattoo appeared here). It's easy to get lost in the site, admiring great tattoos and reading fabulous poetry, so head on over to Holly Rose and see what a lovely pairing tattoos and poetry make! Earlier this month, I ran into Mel coming out of Penn Station. She has amazing work, and it was soon clear why. Mel was visiting from Melbourne, Australia, where she works as a tattoo artist at Get Smart Body Art. I told her it reminded me of the style of Thomas Hooper, an artist at New York Adorned whose website (here) showcases some astonishing work, including tattoos made from the dot-style technique. Mel noted that it was an original design that was inked using a rotary tattoo machine, with the purpose of achieving this effect. 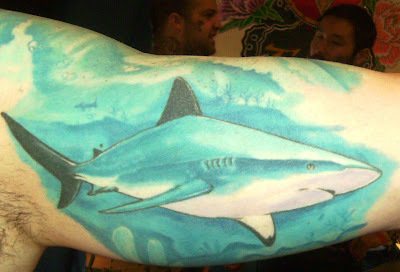 Thomas Hooper's style, she acknowledged, inspired her to attempt this ambitious tattoo. 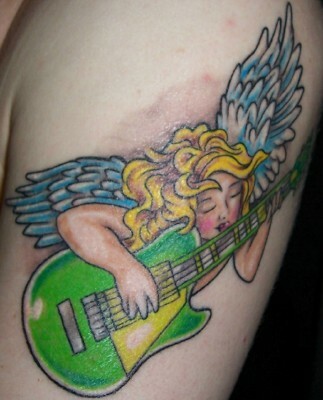 In all fairness, she collaborated with Mick Kelly, at Get Smart Body Art, who did the actual tattooing. Thanks to Mel for sharing this lovely tattoo with us here on Tattoosday! 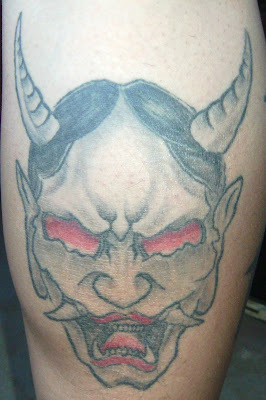 In January 2008, when Tattoosday was a mere infant blog, my mother sent me photos of some of the ink my cousins possessed. I reached out to Ulu (which is a shortened version of her middle name, Uluwehi, which is abbreviated from her full middle name, Kamali'iwahineuluwehi) and we exchanged messages, but we never connected to discuss the tattoo. Then, last month, I was in Hawai'i, at the home of Ulu and her husband Travis. For the record, despite my inkspotting ways, I was never sure if I'd have the opportunity on this trip to document all my nieces' and nephews' ink. I knew I'd be seeing them, but my purpose for doing so was not tattoo-related. But as you may have read over the last week, there I was at Ulu and Travis's place, hanging out with family, and the subject turned inky, and out came the camera. 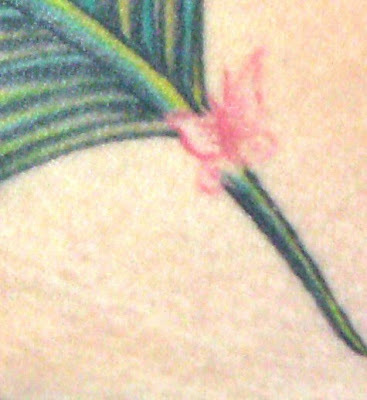 Ulu got this, aside from the beauty of it, to cover up a "tramp stamp" [her words, not mine - no angry comments, please]. 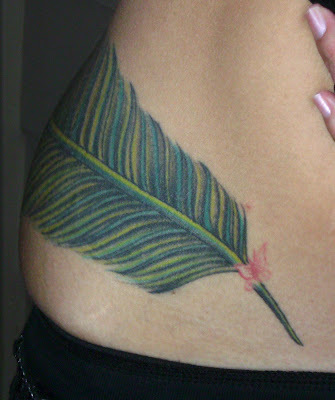 The original piece is covered by the eye of the peacock feather. The artist responsible for this incredible tattoo is Libra, who freelances in Hawai'i, but occasionally does guest spots at 808 Tattoo, and was at East Side Tattoo Studio at the time this was done. In that original email from Grandma Diane (my mom), she also included the tattoos of Travis, Ulu's husband. I had never met Travis before, but was welcomed by him as one of the family. 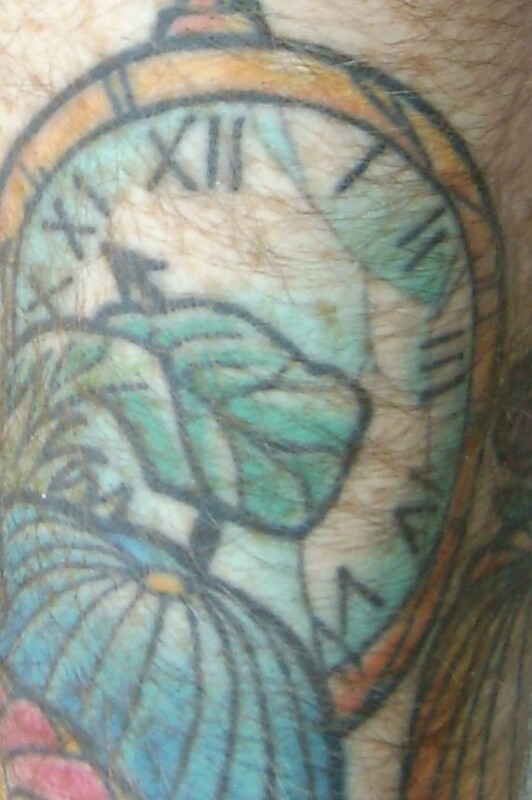 I took my own photo of the forearm ink he wears, also by Libra, in honor of his and Ulu's children, Ezra and Trinity. My deepest and most sincere thanks to both Travis and Ulu, not only for their hospitality and kindness, but for sharing their tattoos with us here on Tattoosday. 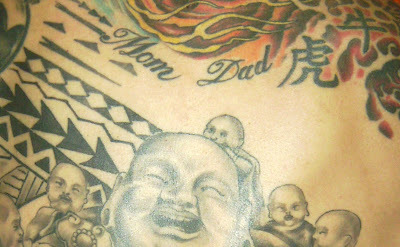 This concludes the "All in the Family" subset of the Tattoosday Goes to Hawai'i series. A warm mahalo to all of my nieces and nephews for letting their mainland uncle help share their tattoos with the Tattoosday community. I met Shawn in Penn Station near the Amtrak terminal earlier this month. He was doing what most people are doing when I stop them in Penn Station: waiting for a train. He was with who I will presume to be his wife and toddler son. I noticed he had tattoos on his arms so I approached him and told him about Tattoosday. Shawn drew this design himself. As a person who liked cats, this feline is based on a cat that he once had named "Do" (as in "How do you do?"). "What happened to Do?" I asked. Shawn looked over at his son and said, sadly, "Do was not a family cat." Some feline house pets do not like new babies and do not hide that fact. Since we are taught as a society that babies are more precious than pets, they gave Do up to another home. The cat to the left of Do in the tattoo is "Do's shadow". 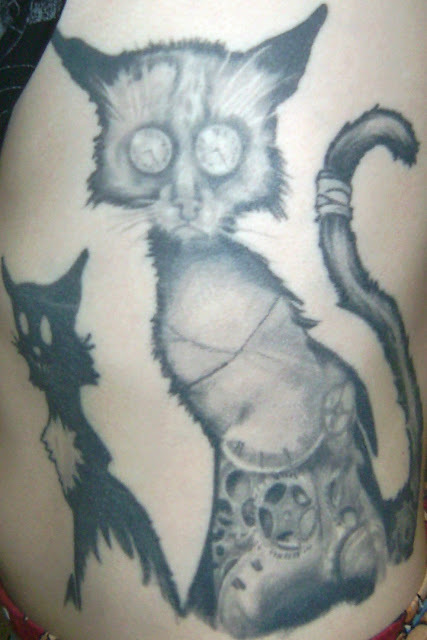 Not just any cat tattoo, Shawn's design is artistic, with clocks for eyes and machinery rumbling away in Do's insides. Shawn also has ink on his back, one leg, and arms (including a sleeve). This piece was tattooed in 12-14 hours by Davie mac at Davie Mac's Tattoos in Niagara Falls, New York. Thanks to Shawn for sharing Do with us here on Tattoosday! Closest of my Hawai'i nieces and nephews is Lehua who, in essence, is a third sister in my Hawai'i ohana. My wife and I had the tremendous honor of Lehua dancing hula at our wedding reception in 1995, which many guests still recall as the highlight of the post-ceremony festivities. Lehua explains that this infinity symbol represents eternity in the context that Poppa John will be remembered forever. What I love about this relatively simple design is that each circle contains an astrological sign, giving more significance to the tattoo. Looking at the photo, the sign on the left is Gemini, and the sign on the right is Sagittarius. 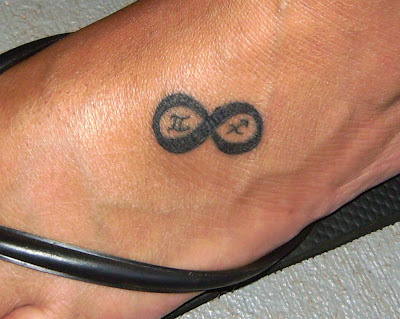 The Gemini sign represents Lehua's son Raycn (Poppa John's great-grandson) and, of course, Sagittarius was the sign of Poppa John. The tattoo thus bridges four generations and is a reminder of the eternal ties that will carry on the memory of John Ferreira. Coincidentally, Raycn shares the same sign as my mother (his great-grandma), Diane, whose birthday happens to be today, May 23. So, even though I know the meaning for Lehua is the link between John and Raycn, through Lehua, I interpret a second unintended meaning: the love of John and Diane, woven together, 25 years in this world, and the rest of time beyond. 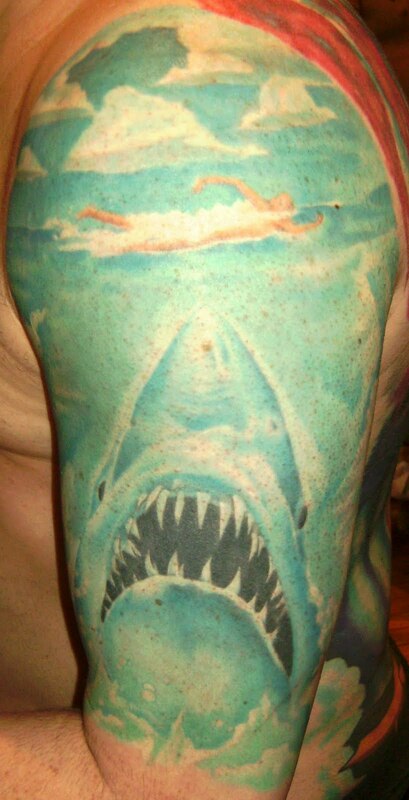 The tattoo was inked by Nick Nakashima at Heart & Soul Ink in Waipahu, Hawai'i. Thanks to Lehua for sharing her tattoo with us here on Tattoosday! 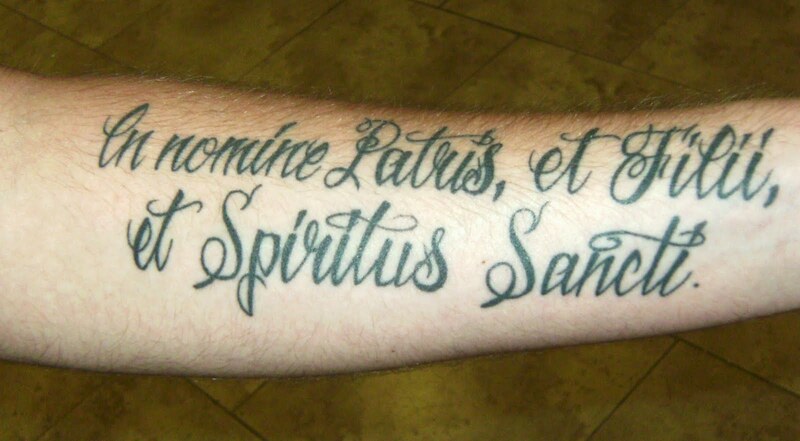 This Latin phrase, "In nomine Patris, et Filii, et Spiritus Sancti " translates to "In the name of the Father, the Son, and the Holy Spirit". Dustin, who serves in the Navy, is a Catholic, and he wanted something that expressed his faith. This is one of his three tattoos. The tattoo was inked by Jeremie Miller at 3D Ink Tattoo Studio in Pensacola, Florida. Thanks to Dustin for sharing his tattoo with us here at Tattoosday! On my last day in Hawai'i I had some time to kill before my flight. I wanted to stay close to the airport, so I headed over to Pearlridge Center to do some last minute shopping. One of the first people I met was Dottie, a Kentuckian who had moved to Oahu. It is a memorial piece for her father, who was a constable back in Kentucky. Sadly, he was killed in the line of duty in 1984. 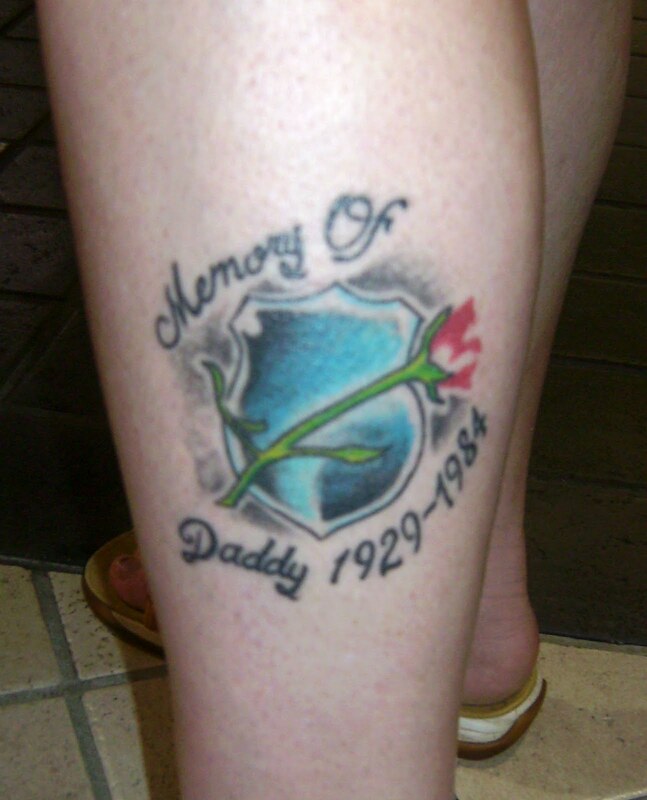 The rose is part of the shield he wore and she incorporated it into the tattoo design. Thanks to Dottie for sharing this emotional tattoo with us here on Tattoosday. Update: Dottie has filled me in on some missing details. 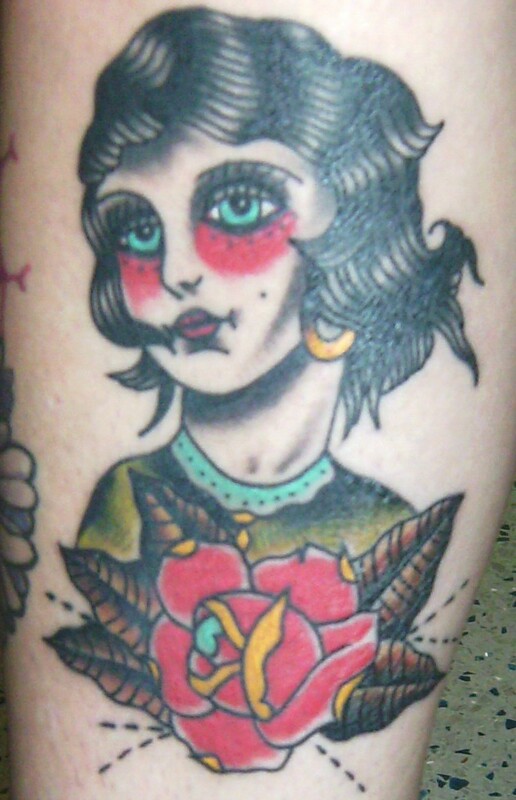 The tattoo was inked at Big Daddy's Tattoos in Elizabethtown, Kentucky. She also wanted to clarify that the shield with the rose is the symbol for the National Law Enforcement Officers Memorial Fund and encourages people, if interested in the memorial, to visit the website here. Continuing with the mini-reunion, of sorts, with my family in Hawai'i, back in April, let's visit with my nephew Ikaika. If seeing my nephew Keali'i for the first time in 18 years was a trip, then talking to Ikaika was an all-out exercise in time travel, it seemed. Ikaika, to my memory, was a toddler, barely a kid. Or, at least that's how I last remembered him. Now, he is an adult, and he remembered who I was, much to my amazement. 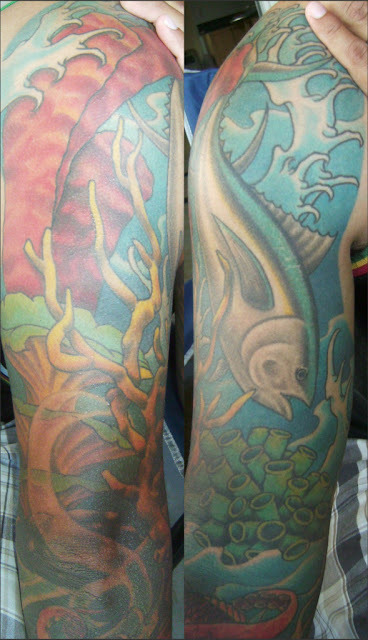 This sleeve represents about twelve hours of work, all done by George "Keoki" Davis at HippoGrafix. 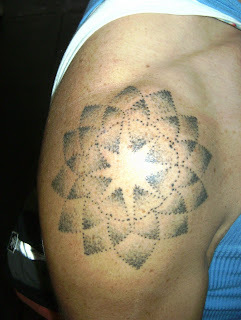 Thanks to my nephew Ikaika for sharing his ink with us here on Tattoosday! Here at Tattoosday, the general rule is not to approach someone about a tattoo unless we can actually see the majority of the piece. 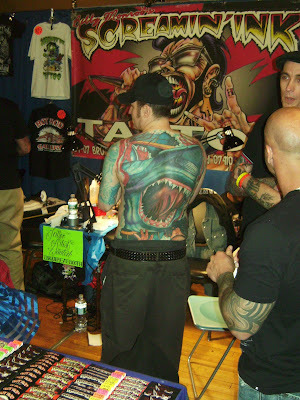 Often, you can tell someone is inked based on design elements peeking out from under clothing. However, it seems to be in poor taste to ask someone about their work when you can't even see what it is. For example, when I spotted Victor popping into an ATM vestibule at 7 Penn Plaza, I only saw a flash of color on his upper right arm, but I had a hunch it would be great. The tattoos are based on Kathie Olivas's artwork, her paintings and studies. "Sugary treats, dichotomous dreamlands, and the cute and corrupted all find their way into the brief calm before the rebellion that feature Olivas's series of characters known as the misery children." This series of paintings and custom figures "focuses on imperfect characters that parallel" a vision of "post-apocalyptic conformity, uniquely documenting their own stories in a mysterious brave new world." "The cast is inspired by early American portraiture that often depicted children as small adults in an idealized new land...They evoke a sense of temporality; [in which] childhood serves as a starting ground, a place where things begin." They also "personify 'cuteness' as more of a representation of projected innocence." Victor's misery children were tattooed by Jose Soto at Inkstop Tattoo NYC. Thanks to Victor for not only sharing the tattoos with us here on Tattoosday, but for introducing many of us to an exciting pop artist. You can see more of Kathie Olivas' work on her cool website here. Mind you, readers, that the last time I saw my nephew Keali'i, he was not yet into the his teens or, if he was, he had just started. So when I saw him for the first time in nearly twenty years, I was stunned. There, in the blindingly bright Kāneʻohe sunlight, where once I had remembered a boy, stood a man. My first glimpse of his tattoos was at a time when I wasn't thinking much about ink - a sad occasion that gives everyone a bit of perspective, in the bright shadows between the living and the dead. It wasn't until later that evening, as small glasses with clear liquor were raised in honor of a departed husband, father, and grandfather, when the talk of tattoos began. 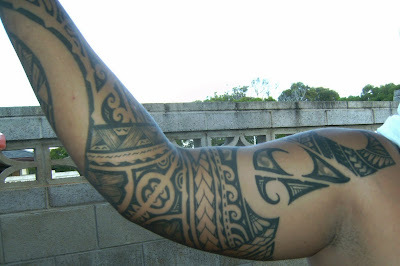 I had known Keali'i had ink, but I never realized how much. He has two full sleeves and he kindly shares them here. 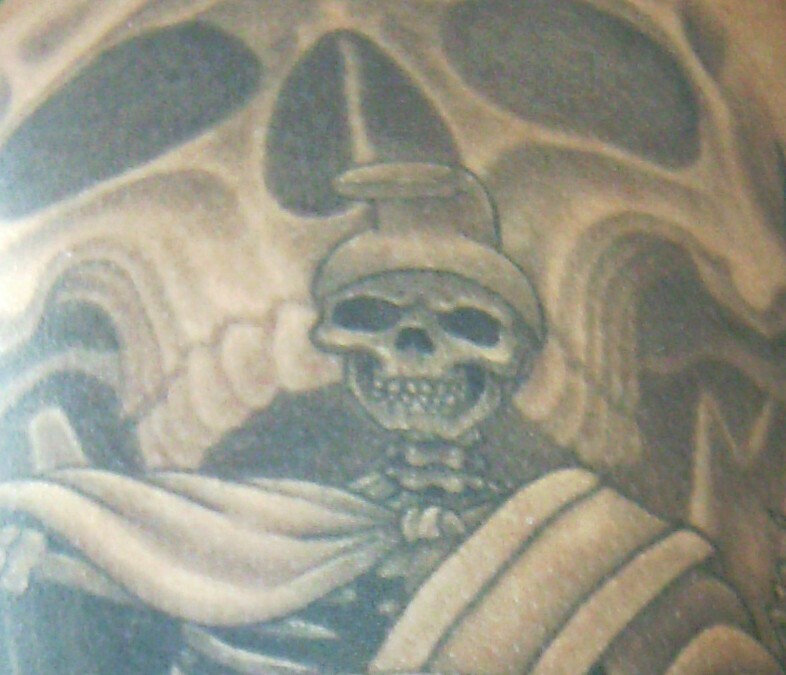 The depiction of the great Hawaiian king, Kamehameha the Great, is a popular element in many tattoos for people honoring the history of Hawai'i. The traditional warrior helmet on the skeleton signifies that this is an undead Kamehameha, a twist on the cultural and historical icon that makes the dark side of Keali'i so unique. My nephew's full Hawaiian name is Keali'i 'O ka Moana, which translates to "Chief of the Ocean". And he lives up to this moniker, being an avid fan of surfing, diving, and fishing. Embracing his love of the sea, Keali'i adorned this side of his body with the bright vibrant colors of the ocean reefs, with multi-hued corals, anemones, and other sea life, including a fish and an octopus. Unfortunately, the bottoms of Keali'i's arms are darker than the tops, a fact that he grudgingly accepts as the cost of being in the sun so much, combined with having naturally darker skin to begin with. His artist, Billy Whitney from 808 Tattoo Studio, has scolded him, Keali'i told me, but he swears up and down he can't help it. Regardless of the visibility of some of this work, it's still wonderfully done and was great to see in person after hearing so long about his great tattoos. I want to say a big mahalo to my nephew, Keali'i, for sharing his sleeves with us here on Tattoosday! Although my recent trip to Hawai'i at the end of April was a bit of a whirlwind, one of the best things about it was reconnecting with a side of the family with whom I hadn't had contact in a long time. Living in New York and raising a family is expensive enough, but making regular trips back home to Hawai'i has become a scarce occurrence and, as a result, my two sisters, and all my nieces and nephews, have grown apart over the years. Our interaction was limited to updates communicated through our parents. But Fate has other plans, and family ties, although they may fray and weaken with age, still remain intact awaiting the opportunity to reconnect and strengthen in the memory of a loved one. So, on the last Monday in April, I was at my niece's house, surrounded by family, most of whom I hadn't seen in almost two decades. And we were drinking and toasting "Poppa John" Ferreira who, in passing, had reunited us here on Oahu. It was surreal to be doing shots with "kids" whose own kids were the same age as they had been when I saw them all last. 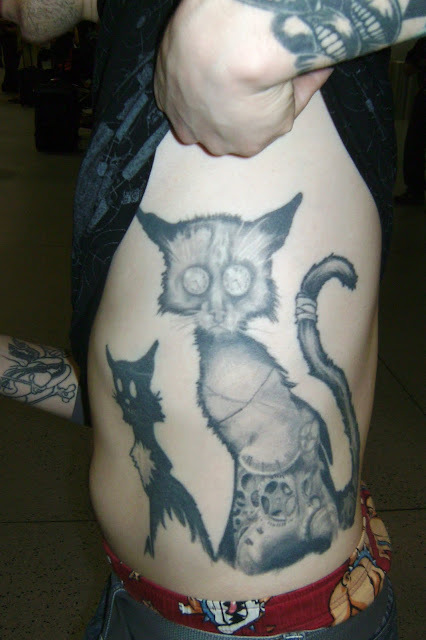 And of course, dear readers, I wouldn't be telling you any of this if it were not for their tattoos. 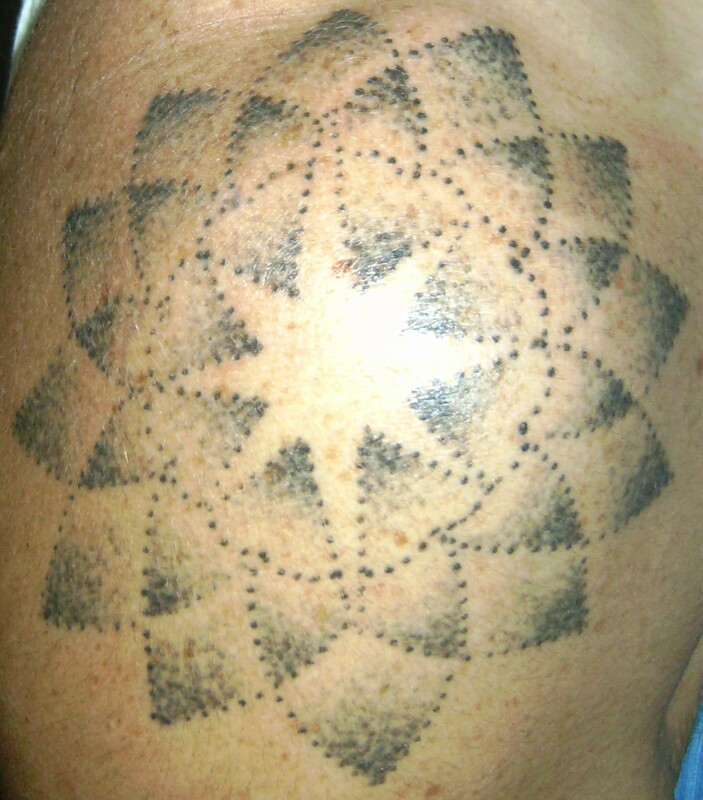 For although that was not why I was in Mililani at my niece Ulu's house that Monday evening, the subject came up, and my family, my distant `ohana, yet `ohana nonetheless, were happy to share their tattoos with me and, by extension, the Tattoosday audience, for your enjoyment. I should mention that I knew my nieces and nephews had ink. I had even seen a picture of Ulu's amazing cover-up (just wait and see), but this was the first time I got a chance to talk with them about their work. This first post started as a nod to my nephew Keali'i but, since I've rambled on and on, we'll just make this a preface, and direct you below (or here) to see his tattoos. Thanks in advance to Keali'i, Lehua, Ikaika, Ulu and her husband Travis for sharing their ink with us here on Tattoosday! 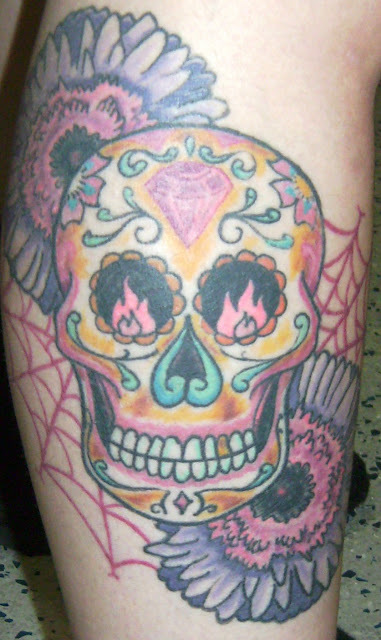 Juli's Right Calf: A Sugar Skull and More! Back in April, I met Juli, who hosts a dozen tattoos, and counting. She offered up two pieces, both on her right calf. Always a fan of sugar skulls here on Tattoosday, I was glad that Juli was more than happy to share this tattoo. She pointed out that the flowers are Gerbera daisies ("my ultimate favorite flower ever") and that the eyes and the tips of the daisies have unusual accents. Chris used an ink known as "Japanese pink," which makes the specific areas of the piece glow in the dark. This was done by Geoff Horn at the Philadelphia Tattoo Arts Convention. I'm hoping that this won't be the last we see from Juli, and I thank her for sharing these great tattoos with us here on Tattoosday! My wife Melanie and I were standing at the balcony, looking down at the floor of the Roseland Ballroom this past weekend at the New York City Tattoo Convention. This offered us a great vantage point of the stage and the mass of inked humanity in attendance. Just to our left down below was one shop booth where a guy was standing with blue tattoos on his arms and you could tell he had color on his back, as well. Occasionally, he would turn toward our position and pull up his shirt to reveal his back to people in the booth. Camera clashes blinked and faces lit up with surprise, shock, and sheer admiration. The first time I saw this, it piqued my curiosity, but so did a lot of things at the show. Then , we saw why he was eliciting such reactions. He turned away from us to reveal one of the more amazing back pieces I have seen. I decided that I'd love to have this as my obligatory post from the convention. 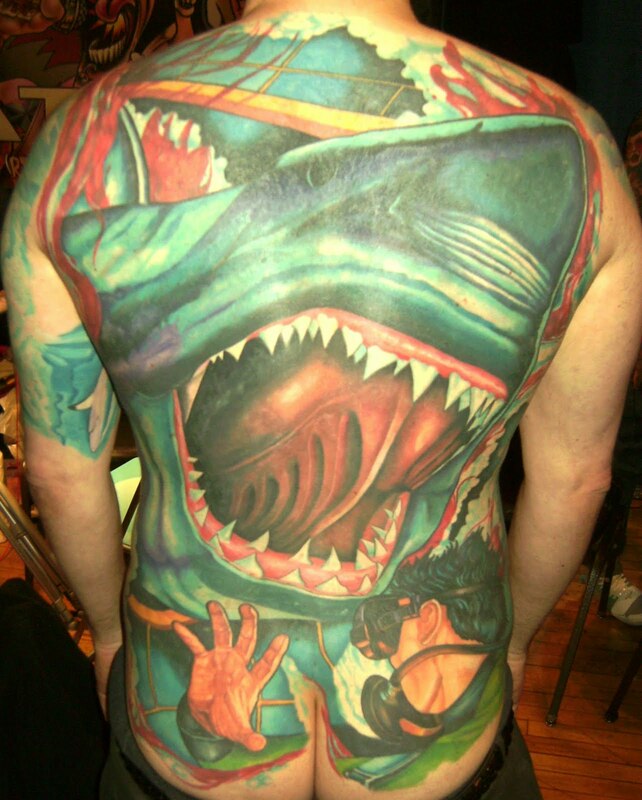 Greg, the host of this astonishing tattoo, spent one and a half years having this worked on by Ian Shafer at Screamin' Ink Tattoo & Body Piercing in Fair Lawn, New Jersey. Greg explained to me that, aside from the obvious love of sharks that he has, the original film was the first movie he remembers seeing with his father. It doesn't hurt that he's a Pisces, either, one of the water-based astrological signs. And, in case you were wondering, Greg told several of us who were admiring the work that the most painful part of this tattoo was the work on the buttocks. Ouch. I took photos of several other tattoos that Greg had but decided they would just detract from this phenomenal tattoo. A hearty thanks to Greg who was very cool in showing off his work on a day where I'm sure he had to remove his shirt more than a few times. I'm rationing all the tattoos I spotted in Hawai'i, which allows me to share the amazing ones I've seen since returning to New York. A huge backlog of ink photos means I can be pickier and share the very best. My first day back in the Big Apple I met Caroline, at the corner of 23rd and 6th, a stone's throw from the Hotel Chelsea. 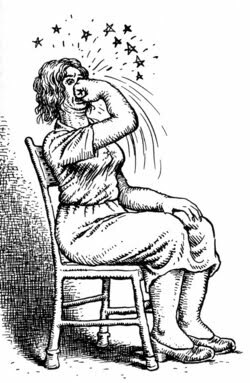 I recognized it immediately as the popular "underground" comic artist R. Crumb. Not that he wasn't already popular, but he illustrated a couple of Charles Bukowski stories in the late '80s, and this image was one used in the Black Sparrow Press issue of his short story "Bring Me Your Love ". Caroline explained to me why this tattoo was essential to her tapestry. She would often, when angry or frustrated, say she was so mad she could punch herself in the face. When she saw the drawing, she knew it would be a perfect tattoo for her. 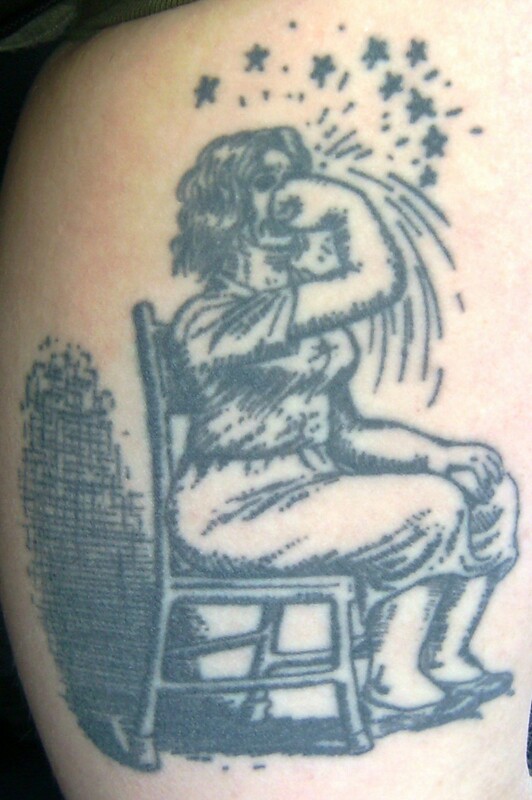 Joe at Saints & Sinners in Baltimore was the artist who transferred R. Crumb's genius onto Caroline's flesh. Thanks again to Caroline for sharing this great tattoo with us here on Tattoosday! I spotted Jeni's ankle back in April in a store on 24th Street between 6th and 7th Avenues. Jeni had been working in film part-time but she had finally decided that movies were what she would devote her life to. That is why the camera points forward. 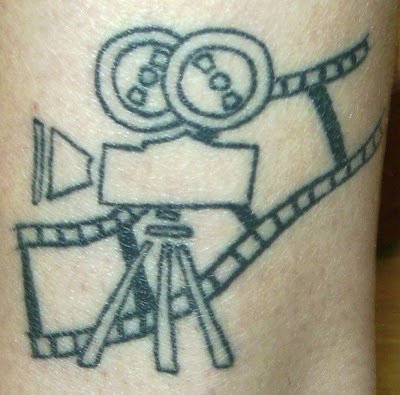 Jeni, a documentarian, who has worked as a unit production manager and on continuity, sees this tattoo as a symbol of her decision to make movie making her life. 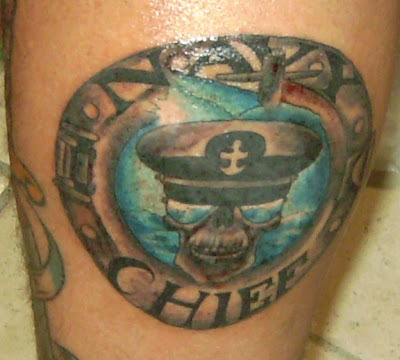 The tattoo was done at an unremembered shop name in Denver. Thanks to Jeni for sharing her tatto with us here on Tattoosday! I don't often run into Tattoosday subjects more than once, but when one works in the same neighborhood, it's often tough NOT to run into them. Case in point is my friend Victor, who I first met here in an example of what I call a tat-alog, when multiple tattoos are photographed and discussed. 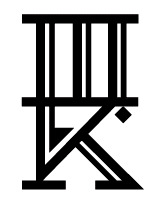 We did a second post on some new cinematic signature ink he had obtained here, and that had been it for a while. There's been a lot of hoopla this week as Jimmy Fallon did a whole Rolling Stones tribute over five days in honor of the reissue of Exile on Main Street. ...[This was] done by my cousin Eddie Bonacore in his apartment...then he did it for me again when he got officially hired as a tattoo artist @ Funhouse Tattooing in the Poconos. 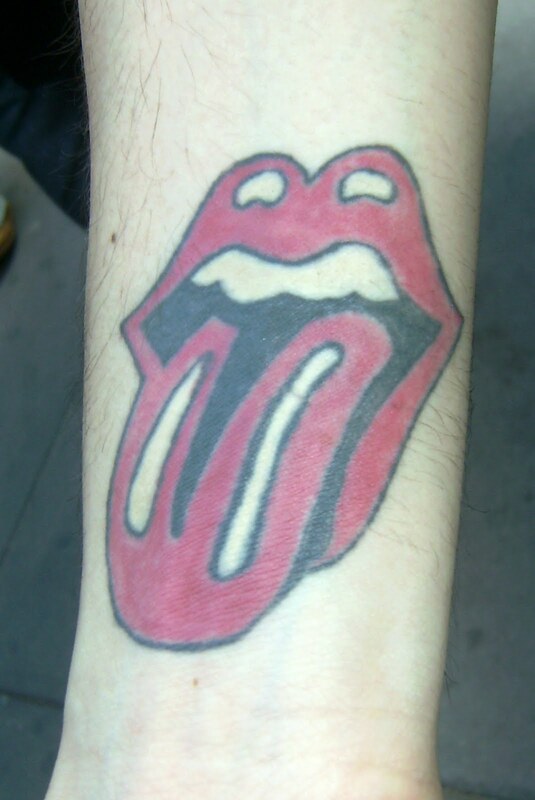 I love the Stones, and credit my mom for that one...she got me into them. The Stones ooze rock n' roll and always will...even watching Shine a Light, the documentary [Martin] Scorsese recently did on them...it just further shows there commitment to rock n' roll...the least I could do was add some tongue to my wrist! 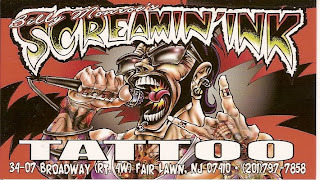 Thanks again to Victor for keeping us entertained with his rockin' tattoos here on Tattoosday! I've alluded, in previous posts, to a trip to Ala Moana Center, during which I was astounded by the amount of tattoos I saw, much more than I recall seeing on my previous trip, five years ago. 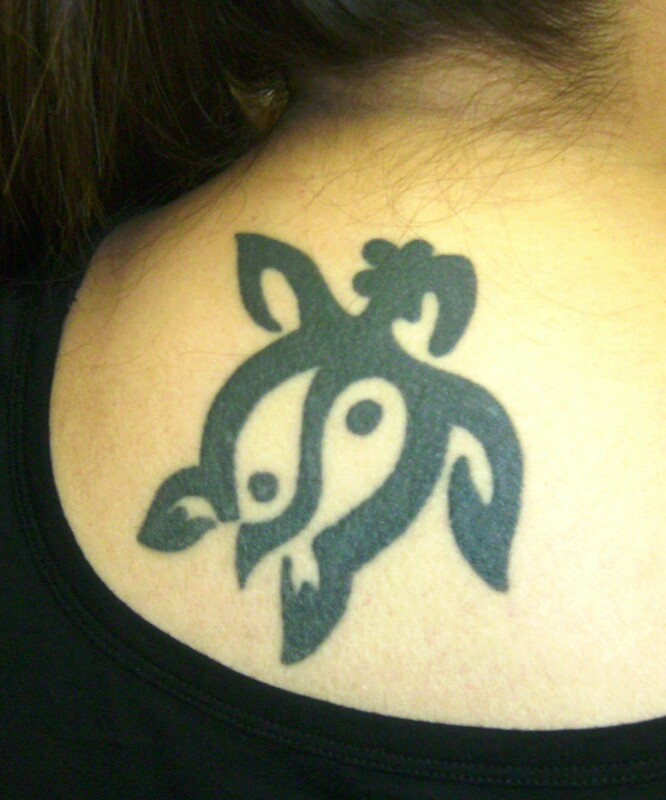 Actually, in Hawaiian tattoo styles, this is referred to more specifically as a mo'o, which can be defined (source here) as a "spirit guardian (lizard) that protects a resource, such as a fishpond, from overuse and other abuse". Mo'o are also referred to as geckos. There's a lot going on with Reston's personal canvas, but you can see the geographic shapes of the mo'o design jumping off the skin. All the work was done in California. The Buddha back piece was inked by Jon Highland, owner of 12 Monkeys Tattoo in Tracy, California. 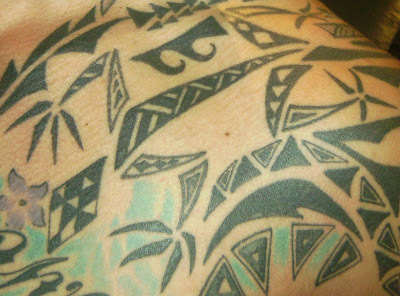 The majority of the tribal/Polynesian work was tattooed by Orly at Humble Beginnings Tattoo Studio in San Jose. A hearty mahalo to Reston for being bold enough to remove his shirt in the Ala Moana food court so we could all get to better appreciate his ink. We here at Tattoosday thank you for your contributions to the site!